Ragnarok ist ein kostenloses DLC für ARK: Survival Evolved. Ragnarok wurde am 12. Juni 2017 für die PC, Mac und Linux Version von ARK veröffentlicht. Konsolen erhielten das DLC am 29. August 2017. Die Hälfte der Karte war verfügbar als sie für den PC veröffentlicht wurde und 75% waren fertig zur Konsolenveröffentlichung. Die Karte wurde als 99% fertig erklärt im Dezember 2017 für PC und Januar 2018 für Konsolen. Im Singleplayer Modus auf Konsolen muss man die Ascension auf der Stufe Beta bestanden haben um Zugriff auf Ragnarok zu erhalten. Um ohne Ascension zu spielen kann man alternativ den Code: cheat playercommand Ascend2 nutzen während man sein The Island Spielstand geladen hat. Ragnarok adds several new creatures, such as the Ice Wyvern, Polar Bear, and Griffin, as well as 2 new dungeon bosses: the Ice Worm and the Lava Golem. It's a whole new map that boasts an expansive 144 sq. 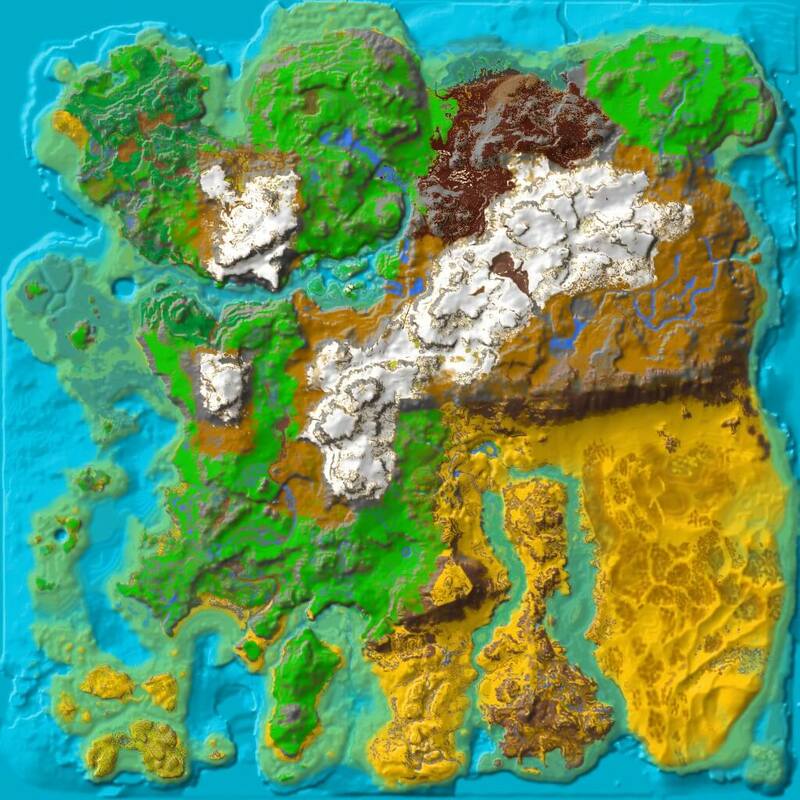 kilometer environment, an active volcano, species from DLC Scorched Earth, and higher than average spawn rates of Megalania and Ovis (creatures that are harder to find on other maps). The map is 99% complete. Chunks of the map will be incrementally released in later patches. On Ragnarok there are unique Beaver Dams; they are bigger and look more like beaver dams in real life. Beavers can live in the Dams, too. Creatures tamed and items received on Official Ragnarok servers can be brought to the vanilla map The Island, except Polar Bears. Ragnarok is approximately 2.5x the size of The Island, in terms of land mass, and roughly 4x in total size. These calculations do not account for the significant, wide-ranging cave networks, and sizable dungeons. Here you see some pictures taken in the editor at same scale to show you how big Ragnarok is. Notice: The below region information is incomplete and will be added to/changed in the near future. In addition to the DLC creatures, all creatures from The Island and Scorched Earth can be found somewhere on the map, except the Phoenix. Displayed are the locations for Ragnarok. For locations on other maps, please see The Island, The Center, Aberration or Scorched Earth. Hier sind nur die offiziellen DLCs aufgeführt. Für mods siehe dort. Diese Seite wurde zuletzt am 26. Dezember 2018 um 22:19 Uhr bearbeitet.